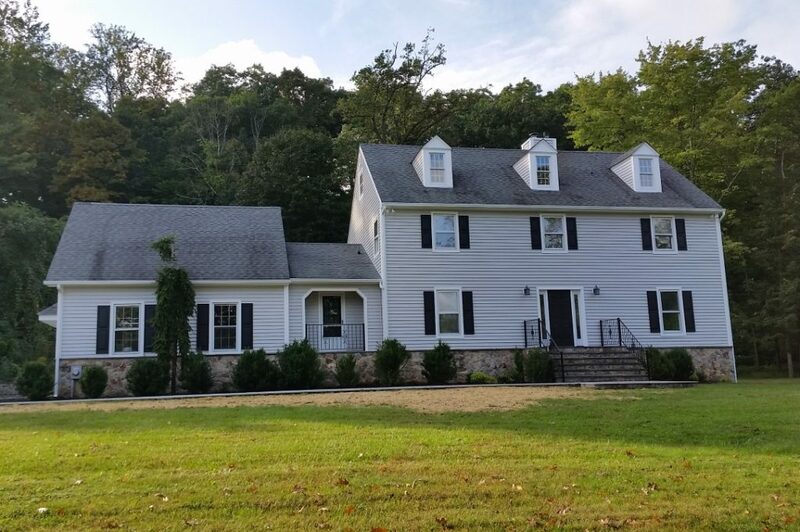 Tastefully renovated & updated 4 bed, 2.5 bath Center Hall Colonial on .85 acre of level land in Chappaqua w/Byram Hills Schools. All new vinyl siding & Blue Stone walkway. Beautiful entrance hall w/new front door, natural stone floor, coat closet & newly renovated powder room. Office/library on first floor can also be used as guest room/5th bedroom. New kitchen w/Shaker style cabinetry, SS appliances, tiled floor & back splashes w/glass slider out to over-sized deck. Generous family room w/fireplace right off kitchen. Huge formal living room & dining room. Gleaming hardwood floors throughout. Attached 2 car garage w/laundry & mud room. Second floor boasts large master suite w/beautiful new bath & his/hers walk-in closets. New hall bath plus 3 more good sized bedrooms on this level. Recessed lighting throughout. New Aquasna well water filtration system. New water heater & above ground oil tank. Central forced air heating & A/C. Full walkout basement. Listed by Phyllis Lerner. 914-762-0070.